It may be a bit unusual to start a book review with the Contributors’ biographies (pp. 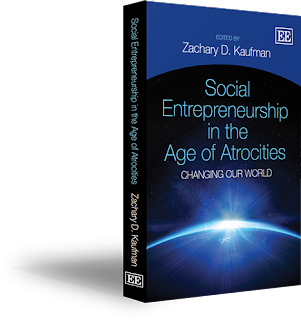 xvi-xxvii), but to understand the context of Zachary D. Kaufman’s edited volume Social Entrepreneurship in the Age of Atrocities. Changing our World they are worth a closer look. Some of the biographies comprise an entire page and the catchwords read like a ‘what-is-what’ in North American personal, intellectual, entrepreneurial, cultural and social achievement: ‘Yale’, ‘Harvard’, ‘Oxford’, ‘founder’, ‘executive director’, ‘CEO’, ‘McKinsey & Co.’, ‘White House Fellow’, a couple of high-profile law firms, the full range of transatlantic scholarships and multiple leadership awards. Many of those catchwords appear more than once and morph into a network of Yale and Oxford graduated management consultants who have also been giving back ‘pro-bono’ throughout their studies and careers. The eight case studies (Seven success stories and one failed project) of social entrepreneurism that Kaufman features in the book explore the potential and document real challenges and real positive impact through good, smart aid projects that take place in a very U.S.-American discourse of entrepreneurship, volunteering and giving. The book is a worthwhile and stimulating read, because all of the case studies provide valuable insights into social entrepreneurship which are basically valuable lessons for all sorts of ‘non-governmental’ engagement in international development. The book also features the case studies in a personal and reflective way and there is absolutely no doubt that each individual and organization cared for their cause, for the people involved and thought about sustainable positive impact. But similar to the initial enthusiasm around microcredit/microfinance a few years ago, Kaufman does not provide critical reflections on how the Western models, economic foundations, social expectations and lifestyles can provide a unique two-way exchange or address some of the looming ‘development’ questions, e.g. around inclusion or equality, ‘at home’. In short, the book is, in the most positive of meanings, the equivalent of an Oprah Winfrey ‘Master Class’: You will meet inspiring people and projects and there will be valuable nuggets of wisdom – but the program is over before the discussion reaches a more ‘political’ or ‘structural’ level of why things are the way they are. Zachary D. Kaufman’s Introduction points out some important commonalities that social entrepreneurs share, such as their deep commitment, their proactiveness, creativity, risk-acceptance, but also patience and collaborative leadership styles (pp. 6-7). He is also very clear in outlining the purpose of the book: Raising ‘public awareness about social entrepreneurship’ as well as ‘exploring leadership in innovative activist organizations’ (p. 11) are definitely two core themes that are addressed in every chapter. I would have liked the chapter to be more grounded in theory and the paragraph on ‘unintended consequences’ has a strange focus on a criticism I have never heard before: ‘through executing the ‘Global War on Terror’, we have learned that some seemingly innocent and helpful charities are, in fact, fronts for terrorist organizations’ (p. 9). Kaufman also seems to like short, catchy celebrity quotes, but I am less convinced that a social entrepreneur is ‘what you get when you combine Richard Branson and Mother Theresa – a hybrid between business and value creation’ (p. 2). There is an air of business school case study learning which I am a little bit biased against, but the empirical chapters certainly deserve the reader’s attention. ‘I pray never to see again what I saw’: The National Vision for Sierra Leone focuses on a dialogue social enterprise that managed to influence the post-conflict decision- and consensus-building landscape in Sierra Leone. As with all the chapters, the authors focus on the leaders, leadership and evolution of the particular project/organization and do not attempt to provide a comprehensive background of the politics, war and peace dynamics which enhanced the reading experience significantly for me. The lessons learned – from consensus-based decision making to project planning with limited resources do not claim to be a ‘blueprint’, but they highlight some of the challenging issues in running development-related non-profit organizations – another common theme of all the case studies. Without the ‘sweat equity’ of young social entrepreneurs from Western countries, none of the legal aid service organizations discussed in this chapter would have ever gotten into a position to qualify for significant philanthropic investments (p. 54). Social entrepreneurship in a post-genocide society: Building Rwanda’s first public library, the Kigali Public Library is Kaufman’s own contribution to the debate and another very interesting case study in organizing a project for the public good. He makes an excellent point that an infrastructure project does not just need the brainpower of engaged activists, but also the ‘hard’ skills of attorneys, accountants, architects or engineers (p. 63). The widespread exposure and support the library received from UNESCO, Voice of America and Newsweek (that was in 2004 when news magazines were still relevant ;)...) also highlights an issue that probably deserves more discussion: As important as the ‘pioneering’ spirit is to market your ‘product’, the question remains how successful the second public library – potentially outside the more easily accessible capital city - would be without the USP of ‘first/only...in post-war Rwanda’. ‘Stand bold’: Indego Africa’s business case for Rwandan women is probably the most entrepreneurial case study about a social enterprise that exports, markets and sells artisan products from Africa to U.S. retail chains. What I really enjoyed about the chapter was that it confronted me with some of my own preconceptions about enterprises and the impact they have: As prominent fashion websites described a product from Rwanda as ‘globally friendly wrist candy’ and ‘a fun way to brighten up your look’ (p. 93), ‘[Indego Africa] has succeeded in providing what its artisan partners value most: regular income’ (p. 98). a social entrepreneur’s personal economic insecurity, while often outwardly perceived as inspirational or a badge of honor, eventually undermines his or her organization’s growth (p. 100). So maybe capitalism can create win-win(-win) scenarios after all?! Education is a tricky business as the authors of Transformation through education: Generation Rwanda and access to higher education for Rwanda’s orphans and vulnerable youth learned in their efforts. As admirable and important as it is to listen to student’s and explore their needs carefully especially in the context of higher, tertiary education, I found the rant about the ‘armies of consultants with PhDs’ (p. 119) who are unable or unwilling to deliver results a bit rough. But the organization uses an elaborated set of monitoring tools and I also agree that ‘pressuring people to work with us’ or ‘handing out scholarships’ (p. 122) is not the best approach. The bigger question remains as to how a well-managed smaller enterprise can scale up its operations in a complex sector like education without compromising its core relationships and values - and what bigger, traditional donors can learn from more flexible initiatives. The story of Providing access to education for children orphaned or made vulnerable by HIV/AIDS: Orphans Against AIDS features a story that seems to be becoming more and more familiar: Yale undergraduate students travels to Thailand, encounters the plight of children, starts an organization and uses his time at Oxford for a more sustained effort in fundraising and managing a growing organization. As the organization was growing with the help of financial support from Rotary Clubs and the Goldman Sachs foundation ‘partners were by now dispersed in different geographical locations in the U.S. Some went to law school or law and business school, and one took a job in management consulting’ (p. 137) – the typical development grassroots volunteers and organizations take these days...I do not want to sound too cynical, but this chapter in particular relies quite heavily on the founder’s success story in a conducive social environment. Inspiring generational change: Americans for Informed Democracy presents a organizational story that was ‘based out of a dorm room at the University of Oxford’ (p. 146) and turned into a 20,000 member networking foundation. As impressive as the fundraising efforts were and the composition of the global advisory board looks to work towards the ‘proof that Americans are caring, intelligent, motivated citizens who, when given the information and tools, will fight to make the world a better place’ (p. 163), I was not 100% sure about the social entrepreneurial aspect of the case study. It is certainly a worthwhile and positive networking story, but also one that seems to be very heavily influenced by a unique and traditional network. The final case study presents a social enterprise that ultimately was not successful. Re-connecting cousins: Children of Abraham started out to build an international community of Muslim and Jewish youth to foster mutual learning and celebrating diverse religious identities. The case study provides some valuable lessons from poor staffing choices to overestimating the appeal of the organization in the very different cultural setting of France where the organization relocated to (‘American models of dialogue and bridge building are not necessarily adaptable to other cultures’ (p. 182), the challenge of keeping overhead cost low and thereby neglecting investment in necessary IT infrastructure and the challenges of mental well-being and burn-out by overly committed members of the organization. This is an important chapter of the book and being open about failure is definitely one of the key lessons that one can take away from this chapter. Zachary D. Kaufman summarizes the Lessons learned and conclusion in the final chapter. Again, the chapter is sometimes a bit heavy on the catchy quotes from football coach Bear Bryant to Ronald Reagan. But he mentions many important points that have come up in the chapters, including luck at the right moment, a sympathetic employer that allows for pro-bono work as well as a youthful spirit and determination to challenge some of the foundations of the aid industry. The book is rounded off with a comprehensive Appendix that features online resources, an organizational directory, books, foundations, blogs and scholarships. The book is a very interesting and important window into how today’s ‘high potentials’ engage in international development with an enhanced set of skills and a strong entrepreneurial spirit to have a sustainable impact. All of the contributors seem to know a lot about leadership, project management and ‘development 2.0’ which indirectly puts a spotlight on traditional donors and organizations and the many ways they often do not seem to get ‘it’ (yet?). It also raises questions for educators on all levels how to ensure a balanced education that includes critical development, hands-on, and entrepreneurial thinking and skills. As development dynamics are changing rapidly large organizations either need to be more ‘entrepreneurial’ – or they need to communicate better why these models may not be appropriate in a specific context. From a research perspective, I am wondering whether some of the success stories have been positively distorted by the entrepreneur’s status and positionality: Accessing high-caliber mentoring opportunities and avenues for significant fundraising or publicity may be easier once you have entered certain university- or company-based networks and are exposed to a culture of charitable giving, volunteering, pro-bono work and innovative organizational practices and leadership styles in various industries. It would be fantastic if some of the ideas and approaches could be taken on by grassroots initiatives and a more diverse group of citizens. Social Entrepreneurship in the Age of Atrocities is definitely an important contribution to the debate, but tough questions about the underlying ‘entrepreneurial’ social and economic discourses remain as well as the question of how the entire social entrepreneurial ‘value chain’ can be transformed for a more equitable and co-operative global future. Kaufman, Zachary D. (ed. ): Social Entrepreneurship in the Age of Atrocities. Changing our World, ISBN: 978-1781002216, 259 pages, GBP 29.95, Edward Elgar Publishing. Full disclosure: I contacted Zachary Kaufman about a review copy which he provided in November 2012.